Writing an academic essay entails combining different sets of ideas into one argument. This may prove to be a difficult task and what is more difficult is finding the appropriate title to perfectly fit the essay. The title of the essay, being the first thing that catches the readers’ eye should be able to draw them in. Many famous authors concur that finding the appropriate title helps them to better structure their essay. A good topic should neither be too long nor too short. A catchy title may set your paper apart and may give the reader a sense of perspective, content and slant of the essay. A good title focuses on three major elements: the hook, the key terms and the sourceWriting Topic Generator does not only implement the three keys elements but also avails the user with a wide variety of topics to choose from. The different titles provide the writer with different viewpoints on a topic. 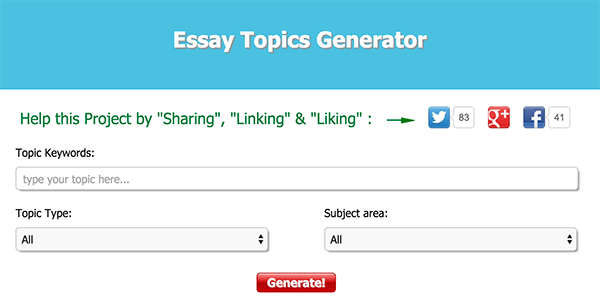 The essay topic generator is not only for students but teachers and researchers as well. The tools is more common among the first year college and high school students and teachers who are new in the field. The generating tool is simple to use, and since it is just a web server with queries on certain topics there are no major concerns concerning Web security. This is in contrast with popular sites like Word Press that are likely to get the attention of unsavory people that can hack and launch malicious attacks. The main function of the tool is to provide information to be used to generate content. The tool operates by using keywords to group topics. Once you have consolidated your thought and chosen the best key word for example violence. You are required to choose a topic type from a range of options i.e. argumentative, persuasive, classification, definition, reflective and narrative. After choosing one of the topic types you are required to choose a subject area also from a drop down list. A list of twenty five essay topic is generated from which you can choose from. The list can also help expand your line of thought. The tools is guaranteed to succeed and you can help by post your link on social media or liking our page. Your suggestions and opinions are also valued. For more information on the topic you can contact us through [email protected] essaytopicgenerator.com or call us using the above information.